Excavator hydraulic systems are powered by hydraulic fluids derived from mineral oils. Hydraulic fluids operate at constant pressure created by one or more pumps known as “hydraulic prime movers.” This pumping action causes the transfer of energy to actuators, hydraulic motors and hydraulic cylinders. Besides transferring motion to various parts, the fluids also serve to lubricate friction parts and prevent corrosion. Since mineral oil must freely pass through hydraulic lines, hydraulic system channels and high pressure hoses, it should be able to maintain the proper viscosity at a range of operating temperatures. It should also retain its performance characteristics with temperature deviations found in extreme cold and extreme heat climates and with temperature variations that come with the change of seasons. Another important characteristic of hydraulic fluid is its ability to resist the affects of oxidation and remain stable against chemical reactions with hydraulic system construction materials (bronze, steel, rubber, plastic etc), as well as with other dynamic parameters both in storage and operation. Manufacturers offer many types of hydraulic fluids for use in various climates and make recommendations on which fluid is best for a particular climate and equipment type. The above requirements for operating fluids must be observed in the operation and maintenance of your of equipment. 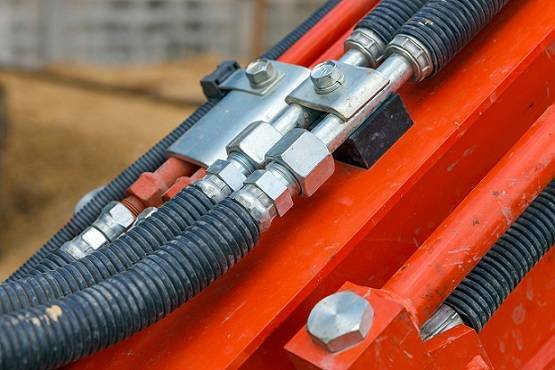 The hydraulic system in any piece of equipment must be able to maintain air tightness to avoid the entry of moisture, dust and other contaminants that will rapidly degrade the quality of the fluids and damage internal parts. Hydraulic fluids are usually delivered in special barrels or by oil-carrier trucks. Reputable manufacturers normally guarantee the quality of fresh and unused oils, but it is still in your best interest to test the oils and fluids before use to ensure its absence of contaminates and to ensure that it meets the requirements of your equipment. Testing is initiated by taking samples of the fluid and performing an analysis. If the testing and analysis reveal that the oil or fluid does not measure up to the quality standard, or contains unacceptable levels of contaminates, the oil should either be replaced or cleaned. The manufacturer has a responsibility to provide you with a clean and high quality oil or fluid, but cleaning the oil through an in-house purification process may actually save you time and money over sending the oil back. GlobeCore has a solution for your company. GlobeCore’s UVR equipment line of purification units offer high quality purification of mineral oils that comply with the highest quality standards of new oil. The GlobeCore Regeneration Process restores the oil to new like condition and improves the oil making it more stable and resistant to oxidation. The GlobeCore Process will ensure the highest efficiency of your excavator equipment during operation and will help to eliminate the costs of unscheduled repairs and component replacement caused by hydraulic fluid contamination. The idea that storage of oils and fluids in a clean warehouse will prevent contamination from entering your hydraulic equipment is a dangerous misconception. Oils and fluids may become contaminated during the filling process or during transportation that may or may not be due to the negligence or incompetence of service personnel. Oil carrier tanks must also be checked regularly and cleaned of dirt, dust and water, but ultimately you are the one that must ensure uncontaminated oil or fluid is not being placed in our equipment. Water may enter the oil when filling the hydraulic oil tank when it is raining at the fill location. Water is a major enemy of hydraulic systems because of the corrosion it creates in the internal parts of the hydraulic system. Corrosion from water results in contamination of the fluid and changes the composition of the fluid leading to internal damage and performance problems. For example, the internal surfaces of hydraulic cylinders may form blisters or scratches and may lead to internal leaking of fluids. This will cause the excavator to lose tension and droop when un-powered. The first source of contamination is usually created by, and is introduced into the hydraulic system during the manufacturing process. Slag, metal filings, rubber crumbs, and other manufacturing waste and by-products can all enter the system during the manufacturing process. These unwanted particles may vary in size from only 3 to 5 microns, but still pose problems for sensitive internal parts of the hydraulic system. Obviously, the better the production process, the less debris that will enter the hydraulic system. Less debris will help to reduce the negative impact on the clearances between moving friction parts. Contaminants may also form during the course of the natural wear process of hydraulic system components. Normally these contaminates will be removed by special filters, but once those filters become saturated they will require timely replacement. If the filters are not replaced, contaminates will continue to circulate causing internal damage to your hydraulic system. Besides visual inspections, many manufacturers now include special sensors that indicate filter contamination levels alerting the operators that it is time to replace the filters. Replacing operating liquids based on time, miles/kilometers, or hours was at one time the only real way to manage your equipment preventive maintenance program. Replacement of fluids based on the operating time of the excavator is no longer necessary from an economic and labor cost viewpoint. With time and distance based change intervals, the actual condition of the fluid was not taken into consideration. Today, Oil Sampling and Analysis Programs are far better at monitoring fluids and oils and telling us the proper time to replace or regenerate the oils rather than using time and distance only parameters. Oil analysis, along with timely filter replacement will prevent the contaminates from circulating in your equipment’s hydraulic system. Magnets placed on filters, drain plugs, and in fluid reservoirs can also reduce the amount of metal contaminates from circulating and causing damage in the hydraulic system. Non-organic particles, such as quartz, feldspar, aluminum oxides, and iron pose the greatest amount of danger to the hydraulic drive system. The main danger is that the hardness of these highly damaging particles is higher than that of the hydraulic system parts. These harmful contaminants enter the gaps between the moving friction parts suspended in the fluid. They disrupt the oil film and tear the surface of the components with their edges like a piece of course sandpaper. The time it takes before wear becomes a problem depends on the amount of contamination in the fluid, but unless they are removed or prevented from entering the hydraulic system, they will cause damage. If the size of the particles are between 5 and 45 microns, the pumping assemblies and the spool may further pulverize them causing accelerated component wear. For instance, before operation, the correct radial gap in precision pairs of distribution valves is between 6 and 8 microns. Due to contaminate based wear, the radial gap may grow to as much as between 32 and 46 microns reducing performance and causing long term damage problems. Contamination of oil also occurs when oil comes in contact with dusty air when the fluid is poured into the hydraulic tank or when transported in open containers. Airborne dust may also enter the fluid through loose connections of hydraulic system pressure lines and hoses. The question you may be asking is; Can dust, dirt, and water be excluded from entering the hydraulic system when it is filled? The answer is yes. Since oil is lighter than water, the water will settle below the oil. If at all present, water and other settled contamination will be found at the bottom of the oil container holding the oil you want to introduce into the hydraulic equipment. The oil may be put into the hydraulic tank by placing the end of a suction line into the oil container which effectively eliminates any mixing of oil and outside air. The hose must not however, be lowered to the bottom of the container where it may transfer water, moisture, and other contaminates into your hydraulic equipment fluid reservoir. Of course, the hydraulic system should not be filled with a bucket or other open containers, but with special filling equipment similar to the kind that is used at gas stations. The best way to handle the transfer of oil is with the “refinery – oil truck – hydraulic tank.” In order to prevent contaminants from entering the hydraulic equipment’s fluid reservoir however, the oil from the refinery should be clean. It should also be passed through a “special 4 micron filter” as it is being pumped from the truck’s oil container into the equipment’s hydraulic fluid reservoir tank.